Lilacs | The Messy Palette . . .
Would you believe — more lilacs? What is more enjoyable than coffee or tea and mellow conversation shared with a friend, in any kind of weather? My friend, Carmela, came for a morning visit last week. It was warm and sunny, but early enough in the day to sit outdoors yet still savor hot, strong coffee. Later, we would have switched to iced tea. 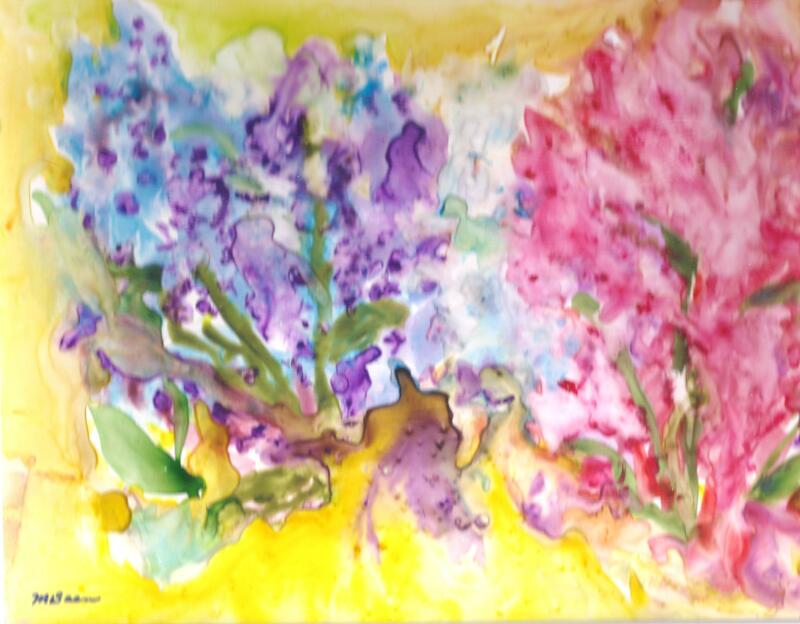 Carmela brought an armful of lilacs, white and shades of lavender, from her yard. I don’t think she realized that lilacs are a huge passion of mine. She simply and instinctively brought the perfect gift—beautiful, fragrant, and in season. Later in the day I began to paint the lilacs, which by then were comfortably at home in a vase of cool water. Since I normally let the paint do a lot of the talking, somehow an illusion of a great blue heron flew into the piece. Can you see the heron? His presence suggests that there is water nearby, as the heron lives on fish. We do have plenty of water here in Lake Country, and great blue herons fly over our roof constantly en route between our myriad of lakes. 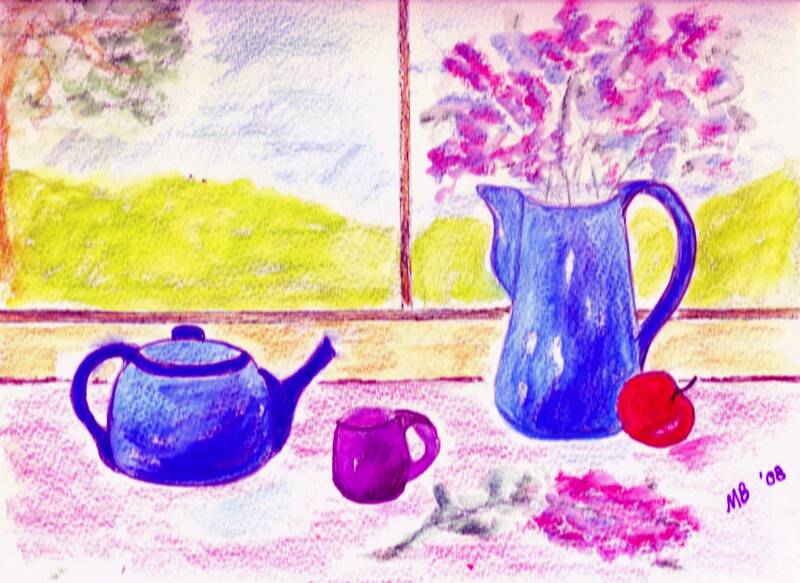 But maybe the above painting, “Carmela’s Lilacs”, is a flashback to our home up north where we lived for eight years, beside a bay with plenty of great blue herons in our neighborhood—and huge, ancient common lilac bushes pressed against the front deck of our home.
. . . of May. April is delightful; I’m loving it. But I can’t get May out of my paintbrushes which seem to be set on “Automatic Paint May“. Don’t you just love the lilac colors? We have French lilacs at every corner of our condo buildings, here in Nashotah Condo Heaven. They bloom a bit later than common lilacs, and are not quite so euphorically fragrant. But the Frenchies are beautiful and perform well in a marinara sauce jar (washed of course, but with its label intact) full of fresh water on the dining room table. Back to May and the lilacs. We do have common lilacs just a few yards away, in the park beyond our front door. Every May I make frequent strolls to inhale the lilacs and journey back decades in time to my small-town-Wisconsin childhood home—a rambling Victorian with a commodious yard and guess what: lots of ancient common lilacs. In a week it will be May. I wonder what my paintbrushes will do then! Winter has finally arrived in Wisconsin. The Northern counties were buried in snow a few days ago, and now we “Southerners” (just north of the Illinois border) are suddenly remembering what winter is all about. Beautiful! Pristine! Cold! The wind travels and moans through our lane, which is actually a wind tunnel between condo buildings. I love the wind, so universal and all encompassing. I could be on the Yorkshire Moors or Scottish Highlands, or at our home in Northern Wisconsin where the furies of winter rampage, and the wind would sound exactly the same. For me, the music of wind is a lullaby at night and an invigorating motivator in the daytime. Winter wind means business. It’s cold, brutal, unfeeling, and unforgiving. Yet as I hunker down and enjoy the peace and respite of winter weeks indoors, I can dream of those winds to come—always howling through our wind tunnel, always sounding like wind, but heralding new seasons: the March wind—boisterous, vandalizing, arrogant, and presumptuous; the April wind—capricious as an April Fool’s joke, yet whispering change; and the winds of May—melodious, enticing, redolant with lilacs. Winter is beautiful. Winter is invigorating. Winter is fun. Given these attributes, we can also add: winter is cold, winter can be treacherous on the roads, winter paths are slippery, and winter is long. But I’m not alone in my choice of metaphor. The four seasons would be hackneyed symbols in literature, were it not for their universality–their ability to touch sensitive people in many cultures with a common experience. Disregarding skiers, dog-sled racers, ice skaters, and other lovers of bitter cold weather, I’ll go on dreaming of lilacs. And while dreaming, there are things to do in anticipation of spring. I cut dogwood and honeysuckle branches, place them in a vase of water indoors, and watch the buds pop. I save my long hair, culled from my hairbrush, to hang on tree branches for birds’ nests in May. No one should ever apologize for dreaming of lilacs! We have a right to dream!